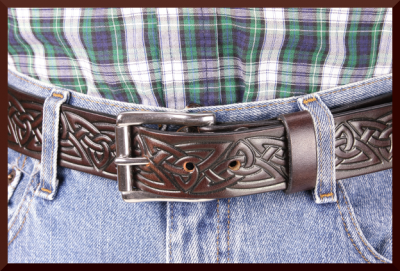 Our celtic embossed leather straps fit with modern buckles. Like all of our belts, the edges are burnished round and hard to prevent fraying. These straps come in your choice of three colors: black, mahogany or tan, and with buckles in either solid brass, nickel over solid brass or stainless steel. We put snaps on the turn so you can change buckles anytime you like. We warantee our belts to last years and years. Our standard sizing fits waist sizes up to 50". Contact us about larger sizes.